In the two years I have been creating and selling contemporary art quilts I have been commissioned to make almost a dozen custom quilts. Sometimes they have been as straightforward as a sunset at the beach or some wonky blocks in black, white, and red geometric fabrics. For one custom project a customer took one of my finished quilts and turned it sideways so the curves of the fabric design ran horizontally instead of vertically as I was displaying it. Then she asked if I could make two smaller quilts with the same fabrics for either side so the curved fabric design continued as in a triptych. You can see the picture of the finished three quilts which came out great. Thankfully I had enough of all the fabrics to meet her custom request. I made another custom quilt in my mosaic design in autumn colors. A customer had seen one of my mosaic quilts and wanted one similar to it. 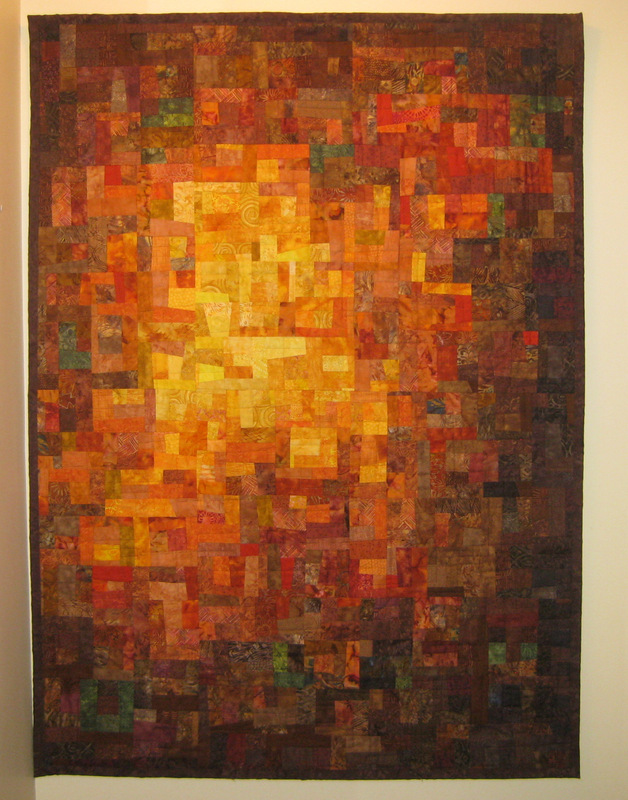 She wanted more fall colors blending in with the browns and she wanted it much larger at 40” W x 60” H. I worked with her over the course of a few weeks, sending pictures of the pieces on my design wall and getting her approval before proceeding to the finished piecing. Working together was fun as I listened to her feedback, would add more of some colors and remove other colors. It was truly a collaborative effort. Initially I wasn’t confident in my abilities to translate a customer’s ideas into an art quilt but with experience I have more confidence. I tend towards bright colors which are not the color palate of many homes where muted earth tones and neutrals are more common. I’m enjoying the challenge of working with different colors to create the special quilts people want to buy. I look forward to more custom orders and the interesting challenges I’ll encounter. I do still turn down about a dozen orders a year from people who want bed size quilts in one of my designs. I’d like to hear experiences from other quilters with custom orders or from customers who have worked with artists on custom orders. I love your work! This latest endeavor of a Blog will add to your exposure – which is what you are looking for. Thanks! You are my partner in fabric shopping and quilting! Let me know what size and design of custom quilt you are interested in.